I’ve always had concerns about the Intelligent Quartz series from Timex owing to the general lack of dial clarity. Silvered hands, reflective indices and so on just adds to what for me personally is often a cluttered and confusing mass of data. 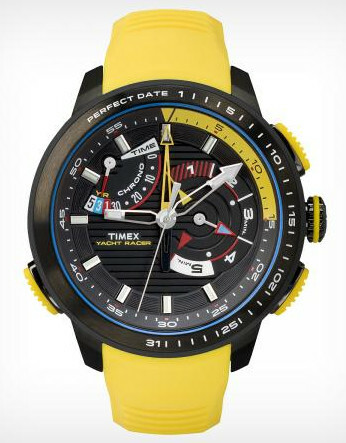 The Timex Intelligent Yacht Racer – a color triumph! 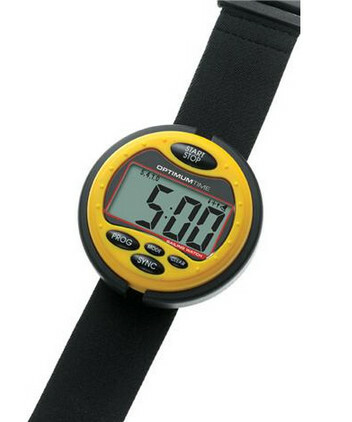 However with the latest Intelligent Quartz Yacht Racer, Timex seem to have addressed that issue in spades. At last the use of color and decent sized hands plus a bit of imagination regarding placement of everything and it looks like a winner – IF you’re into yachting of course, otherwise the delay chronograph starts of 1, 3 and 5 minutes doesn’t make much sense. But the title of course does spell it out – and this is definitely what this model is all about. There are quite a few hands to look at, so instructions are at first a must, though for the core purpose of Yacht racing it’s actually relatively simple. This digital movement model also has a Perpetual “Perfect” Calendar Date function that needn’t be adjusted until 2060 – it’s always correct and indicated by the push of a button, then the big yellow hand indicates the Date as printed on the outer case bezel. After a few seconds it returns to the 12 position. The yacht racing bit is where the chronograph starts after a set countdown period, either 1, 3 or 5 minutes, by counting down to zero and then it starts the main chronograph function. The 3 countdown time sectors can be seen on the sub-dial @3, where you have the different countdown time indications. It’s certainly a big step up from the previous models, basically as I said, owing to the previous clarity issues and this looks on the face of it (sorry!) to be much improved. However I would really have to see it in reality in my hand before being absolutely sure it’s as good as it looks, but I’m certainly very encouraged so far. It is quite a large watch at 47 mm diameter x 14 mm thick and it has a Water Resistance of 100m, which is good. As it’s so colorful it should I’m sure get a few admiring looks from those who don’t have one. It’s also an interesting “on demand” Date concept, getting rid of the often overly small date window buried in amongst the hands and so on – and to just push a button, then indicate the Date clearly on the large bezel seems very sensible – and I like that. So looking good and definitely worth a look – in person . . . . .
Here’s some Yacht race instructions – to get you in the mood. Timex on the odd occasion do get things right and this may be one of those times. The above instructions are part of the .pdf file available for the Intelligent Series and can be downloaded in their entirety from HERE. Of course if you’re really into Yacht racing then maybe you prefer this bespoke Yacht Timer. It’s big at 67 mm and it’s digital display which in this instance may be very clear and it has audible this and that, but for all that it looks just a little – boring? And which do I prefer? – well it’s obvious – the Timex of course, just because of their effort and design – for me they’ve nailed it.